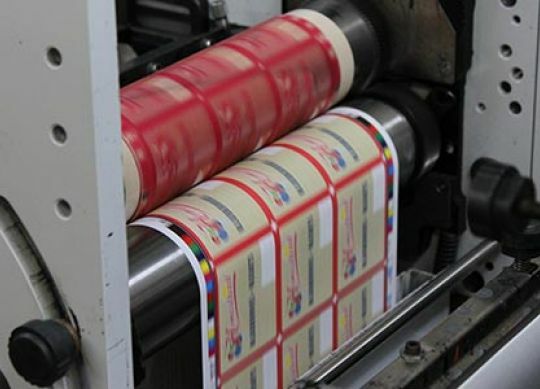 PROMPT PRODUCTION FOR CUSTOM PRINTED LABELS | Cummins Label Inc. Designing and creating custom printed labels can be a challenge depending on your experience, manufacturing tools, and printing resources available to you. But, even if it is a challenge, it’s still an essential part of selling your products. Everyone likes a good label that catches their eye, so you need a custom printed label that grabs the viewers’ attention while also letting them know what your product is. With Cummins Label, we can help you to produce labels at a fast rate that are sure to boost your business. Our art department at Cummins Label is capable of crafting plates for all your food and beer bottle labels. Then, using that plate, your production gets on its way. The plates are designed with precision and offer an easy way to recreate the label again and again. One way we use the plate created is with our option of 10 color flexo printing. With flexography printing, we use the relief plate created by our art department with a variety of colors to really make your custom printed label stand out. The exciting colors provided from this method will draw attention to your product no matter where it sits. If you would rather trust your design’s consistency in printing to the unmatched replication power of a computer, Cummins Label also offers digital printing for production. Beyond the accuracy of digital printing, with your labels’ file saved digitally, you can make quick adjustments you may need as well. Whether it’s the latest IPA or a tub of salsa, your designs will come out strong with digital printing. At Cummins Label, we strive to satisfy the requirements set by you in all your label making needs. With over 40 years of experience in the label making industry, you won’t be disappointed with our services.